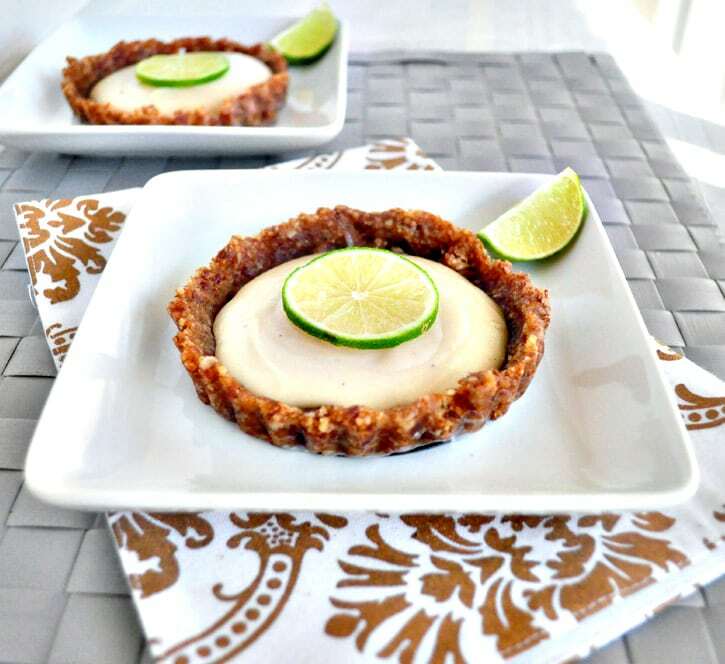 Healthy Key Lime Tarts. One of the things I think of during summer is healthy key lime tarts. I knew I had to find a way to make a healthy key lime vegan tart recipe. My father-in-law loves all things key lime and he loved this key lime tart recipe! I had him come over and taste test them. If you like my Key Lime Larabars, you will love these key lime tarts! I had soaked some cashews because I was making some Smoky Sweet Potato Tacos and the recipe called for a maple cream. I thought they were plenty sweet and didn’t end up making the cream part. The tacos were bomb though! I used the extra cashew cream in this recipe. These little tarts are vegan, grain free, gluten free and raw. I hope you enjoy them as much as we did. Soak the cashews overnight and then drain and rinse. In the food processor , grind up the salt, almonds and pecans until they are a course/crumbly texture. Add the dates and pulse until a dough starts to form. You may need to add a couple tablespoons of water or oil if the dough is not holding well. Press the dough into individual greased tart pans . I have the kind with the removable bottoms. Makes it real easy to remove them afterward. I got five out of my batch. It helps to use wet hands while forming the dough into place. Once all the dough is formed in the cups, place in the fridge for 30 minutes to firm the dough back up. While the dough is firming back up, you can start on the filling. Throw the cashews, coconut milk, sweetener and lime juice in a blender and blend until smooth. I used my Vitamix . Take a taste. If you like it a little more tart, add some more lime juice. Pour the contents into the tart shells and let chill in the fridge for a couple hours. That’s it! I've got the cashews soaking as I type:) Can't wait to try this, I'm planning on taking it to a dinner gathering tomorrow evening and can see this as a go-to summer treat. Yay! I hope it's a hit! I'm making it right now, yum! Could I use almond milk instead of coconut for the filling? I think you might be able to, but it may be a little thinner. I'm allergic to cashews ... any substitutions? I would like to make this into a pie, do you think this is enough filling for one pie shell or should I double the recipe? By the way, I just discovered your site the other day and I am in love with your recipes:) I made your vegan nanaimo bars yesterday and my husband says they taste so close to the real thing!! Oh yay!! So glad you liked those Kristina! Yes I think it might be just enough to fill a pie. Let me know if you try it!